Bankers Healthcare Group acquires a 20-percent stake in Simple Admit, which will incorporate the bank’s lending services into its patient engagement technology. Azalea Health adds chronic care management capabilities from ChartSpan Technologies to its EHR. CipherHealth names Jake Pyles (Paradigm) CFO. Behavioral health and human services EHR vendors Foothold Technology and Exym merge under the Alpine SG corporate umbrella, leading me to surmise from the vaguely worded press release that parent company Alpine Investors has purchased some sort of stake in both companies and swept them into its group of SaaS companies. 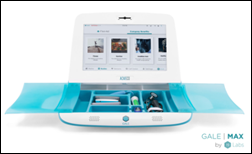 19labs introduces the Gale Digital Health Center for on-site care that includes virtual consult software and diagnostic devices. The California-based startup launched in 2015 with the intent of targeting rural clinics, and has now expanded its sales funnel to include employers, community centers, and nursing homes. Founder and CEO Ram Fish spent several years beforehand as VP of mobile health at Samsung. Say it ain’t so: The Physicians Committee for Responsible Medicine launches a #BreakUpWithBacon campaign in Washington, DC to encourage people to stop eating processed meats, and hospitals to stop serving them. The campaign highlights the fact that such food, though delicious, is a contributor to colon cancer. Aprima and Culbert Healthcare Solutions will exhibit at MGMA September 30-October 2 in Boston.